Bohol is a little island paradise in the southern Philippines. 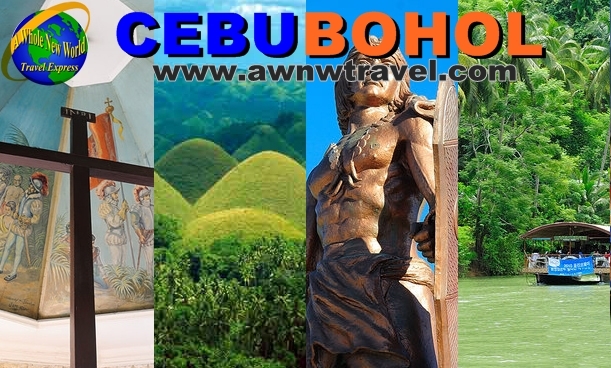 The most notable among the tourist attractions in Bohol is Chocolate Hills. Bohol also has many beautiful and fascinating resorts and beaches. Cebu is the country's oldest Spanish colonial city and has several historic landmarks including the original cross, planted by Magellan in 1521 when he baptised the first group of Filipino natives into the Catholic faith. Cebu is also a shipping crossroads. It is therefore a good jumping-off point for island hopping to the tropical islets of the central Visayas region. Within easy reach are the caves and lagoons of Calanggaman and Gato; the beaches of Argao, Oslob and Carmen; and the favourite dive spots of Moalboal, Badian, Mactan and Olango. Cebu's main claim to fame is its colourful festival, held every third Sunday in January, known as the Sinulog Festival of tribes in dazzling costumes. Confirmed reservations (accommodation) are non refundable. Rebooking fee of Php 300 will apply. If you have other preferred hotel, feel free to contact us so we can quote you.